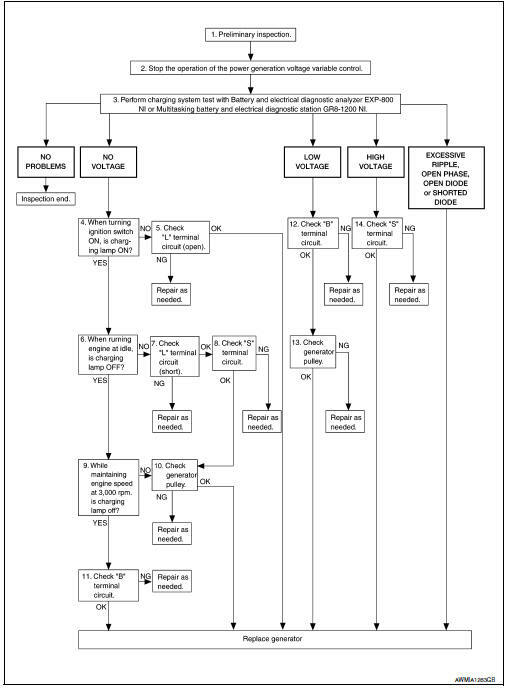 Refer to the applicable Instruction Manual for proper charging system diagnosis procedures. To ensure a complete and thorough diagnosis, the battery, stater and generator test segments must be done as a set from start to finish. Perform the preliminary inspection. Refer to CHG-20, "Diagnosis Procedure". 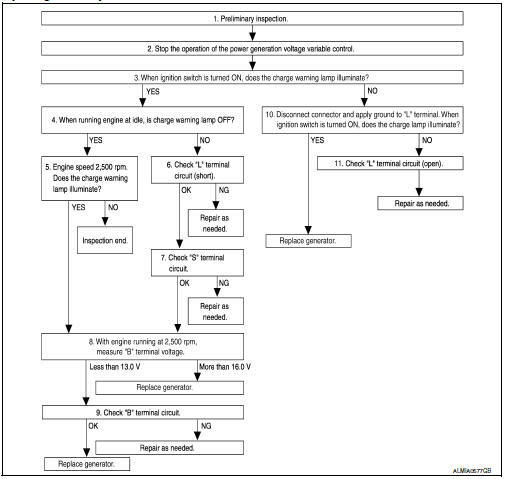 Stop the operation of the power generation voltage variable control in either of the following procedures. Perform the charging system test using Multitasking battery and electrical diagnostic station GR8-1200 NI or Battery and electrical diagnostic analyzer EXP-800 NI. Refer to the applicable Instruction Manual for proper testing procedures. NO PROBLEMS>>Charging system is normal and will also show вЂњDIODE RIPPLEвЂќ test result. EXCESSIVE RIPPLE, OPEN PHASE, OPEN DIODE or SHORTED DIODE>>Replace the generator. Refer to CHG-29, "Removal and Installation". Perform вЂњDIODE RIPPLEвЂќ test again using Multitasking battery and electrical diagnostic station GR8-1200 NI or Battery and electrical diagnostic analyzer EXP-800 NI to confirm repair. Does the charge warning lamp illuminate? YES >> GO TO 6. Check вЂњLвЂќ terminal circuit (open). Refer to CHG-24, "Diagnosis Procedure". Is the вЂњLвЂќ terminal circuit normal? YES >> Replace generator. Refer to CHG-29, "Removal and Installation". NO >> Repair as needed. Start the engine and run it at idle. Does the charge warning lamp turn OFF? YES >> GO TO 9. Check вЂњLвЂќ terminal circuit (short). Refer to CHG-26, "Diagnosis Procedure". Is the вЂњLвЂќ terminal circuit normal? YES >> GO TO 8. Check вЂњSвЂќ terminal circuit. Refer to CHG-27, "Diagnosis Procedure". Is the вЂњSвЂќ terminal circuit normal? YES >> GO TO 10. Increase and maintain the engine speed at 3,000 rpm. Does the charge warning lamp remain off? YES >> GO TO 11. Check generator pulley. Refer to CHG-30, "Inspection". Is generator pulley normal? YES >> Replace generator. Refer to CHG-29, "Removal and Installation". Check вЂњBвЂќ terminal circuit. Refer to CHG-23, "Diagnosis Procedure". Is вЂњBвЂќ terminal circuit normal? YES >> Replace generator. Refer to CHG-29, "Removal and Installation". Is вЂњBвЂќ terminal circuit normal? YES >> GO TO 13. Is the вЂњSвЂќ terminal circuit normal? YES >> Replace generator. Refer to CHG-29, "Removal and Installation". Work flow (without exp-800 ni or gr8-1200 ni). Before performing a generator test, make sure that the battery is fully charged. A 30-volt voltmeter and suitable test probes are necessary for the test. Before starting, inspect the fusible link. When ignition switch is turned ON. Does the charge warning lamp illuminate? Does the charge warning lamp turn OFF? YES >> GO TO 5. Increase and maintain the engine speed at 2,500 rpm. Does the charge warning lamp illuminate? YES >> GO TO 8. Check terminal вЂњLвЂќ circuit for (short). Refer to CHG-26, "Diagnosis Procedure". Check terminal вЂњSвЂќ circuit. Refer to CHG-27, "Diagnosis Procedure". Start engine. With engine running at 2,500 rpm, measure вЂњBвЂќ terminal voltage. What voltage does the measurement result show? Less than 13.0 V>>GO TO 9. More than 16.0 V>>Replace generator. Refer to CHG-29, "Removal and Installation". Is the inspection result normal? YES >> Replace generator. Refer to CHG-29, "Removal and Installation". Disconnect generator connector and apply ground to вЂњLвЂќ terminal. Does the charge warning lamp illuminate? YES >> Replace generator. Refer to CHG-29, "Removal and Installation". Check вЂњLвЂќ terminal circuit (OPEN). Refer to CHG-26, "Diagnosis Procedure".